The following article on American Battery Metals was written by Jeff Nielson, a high-ranking writer at StockHouse.com. Jeff has a background in economics & law, and has published > 1,300 articles. He covers mining, cannabis, technology & energy companies. This is a Guest Post, Peter Epstein and Epstein Research [ER], had nothing to do with its preparation, editing, formatting, content or distribution. Please see disclosures at the bottom of the page. American Battery Metals Corp. (CSE: ABC) is a new junior mining company that is (re)developing the Temple Mountain Vanadium/Uranium mining complex. History buffs may recognize that name. It was at Temple Mountain that Madame Curie did her revolutionary (but tragic) research into radioactivity. Temple Mountain was also the site of important work on The Manhattan Project. More on the fascinating history of Temple Mountain later, as well as the new mining exploration taking place here. When the President & CEO of American Battery Metals, Michael Mulberry connected with Stockhouse Editorial for a conference call, it was clear that he wanted to discuss more than just mining operations at Temple Mountain. This is a management team that is not merely familiar with drillcores and geological surveying. They also know metals markets and Michael Mulberry wanted to talk “vanadium”. Why is vanadium of such critical importance on the energy storage side of the Battery Metals Revolution? Mulberry explained. That partially accounts for why the price of vanadium pentoxide, V2O5 soared to nearly US$34 per pound near the end of 2018, rising more than ten-fold from its price at the beginning of 2016 (~US$3 per pound). 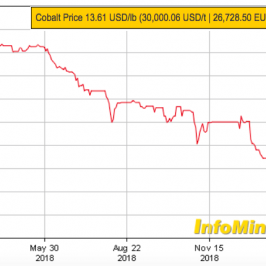 While the price of vanadium has retreated significantly since then, currently below US$15 per pound, there are several reasons to expect this decline to be temporary. As with many metals markets, acquiring a better grasp of supply/demand fundamentals starts in China. CEO Mulberry offered additional insights here. An important metal, with strong and rising demand in China – for both new and conventional applications. Illustrating the importance of vanadium in the 21st century economy of China, China is currently commissioning the world’s largest vanadium energy storage cell, an enormous 10MW/40MWh vanadium redox (flow) battery, with Phase 1 of this project now complete. Slightly further down the road in China is a mammoth project, a 200MW/800MWh vanadium flow battery system being manufactured by Rongke Power and expected to come online in 2020. To put this into context, globally there is currently a total of 256MW of energy storage capacity via vanadium-based batteries. 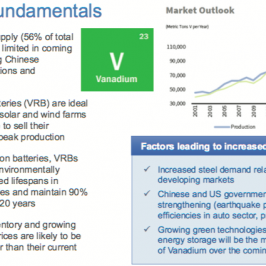 The vanadium market is not merely a demand story. Vanadium is a scarce metal. Unlike cobalt (another scarce battery metal), vanadium is found in deposits which can support primary vanadium mining. But such deposits are rare, and most known sources of vanadium today are in jurisdictions that are viewed as less-than-ideal by Western governments. For this reason, vanadium has been added to the U.S. government’s “critical minerals” list, meaning that the U.S. sees an important need for the development of domestic sources of this vital metal. Enter Temple Mountain and American Battery Metals. The Temple Mountain property is a 435-hectare land package, comprised of 52 contiguous claims. Mineralization was first discovered in 1898, with mining operations taking place intermittently from 1914 through 1978. The high-grade mineralization found at Temple Mountain typically comes in the form of “lens” formations. Altogether, more than 3,000,000 pounds of vanadium have been mined here. As implied by its (famous) past, Temple Mountain has historically been regarded as a uranium operation. Indeed, when mining at Temple Mountain ceased in 1978 it was due to a decline in the price of uranium. Here it is important to note that relative to today’s price for vanadium, historic prices were far lower. This reflects the fact that prior to the Battery Metals Revolution, demand for vanadium was almost exclusively as an alloy in the steel-making industry. As noted by Michael Mulberry, vanadium makes steel stronger. That’s still an important component of vanadium demand. However, with the additional robust-and-rising demand for vanadium as the primary material used in energy storage cells (as much as 85% vanadium), this translates into a permanent change in the price level for this metal. 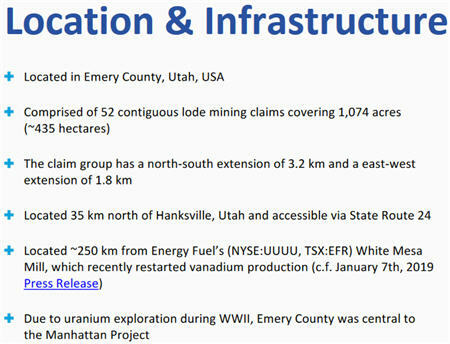 At Temple Mountain, the high-grade mineralization tends to occur at roughly a 5:1 ratio of vanadium to uranium. In historical mining at Temple Mountain, the relative pricing of the two metals still made uranium the “primary” metal. In any future mining, it will now be the vanadium that is of primary importance. Management of American Battery Metals has an enormous amount of historical mining data to process here. Included in this data are historical drilling intercepts assaying at grades as high as 4.97% V2O5 and 1.85% U3O8. When it comes to technical work on this Project and analysis of the local geology, the expert is John Walther. Walther is a professional geologist and consultant for GeoMinEx Consultants. He’s also a Director of American Battery Metals. “While the first claims in the Temple Mountain area were staked in 1898, the economic potential of the geology in the district was first studied in 1913. Since this time, the understanding of the collapse structures, alteration and genesis that created these deposits have improved considerably. The Temple Mountain collapse structure is the largest of the district and is about 3,000 feet long and 1,500 feet wide. This provided the channels through which uranium and vanadium rich fluids were introduced. Other factors such as folding, composition of sedimentary rocks and the presence of hydrocarbons in the rocks contributed to the size, shape and distribution of these near surface lenses of mineralization. While Temple Mountain is an historically famous site with decades of mining history, American Battery Metals itself is a brand-new company. 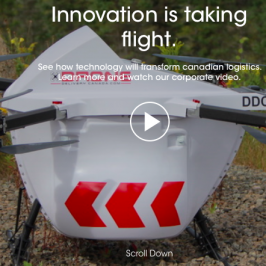 The Company came into existence via an IPO in November 2018. 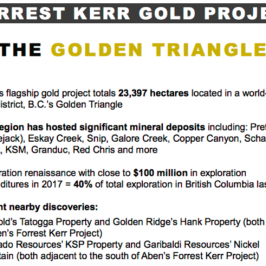 Management is already methodically completing the work necessary to commence an initial drilling campaign, including exploration permitting and some modest road construction. The permitting process has taken slightly longer than expected. The result is that drilling is expected to commence in Q2 rather than at the end of Q1. A 1,000-meter drilling program is planned (and fully funded), to be comprised of 10 near-surface drill holes. Six of the 10 targets have already been chosen, but with the amount of historical data available plus all the visible evidence of past mine workings, there are an abundance of targets from which to choose. Another important member of the Company’s technical team is Matthew Rhoades. Rhoades is the QP (“qualified person”) for American Battery Metals, an experienced professional geologist with broad exposure to the mining industry. This includes serving as the former State Geologist for New Mexico. 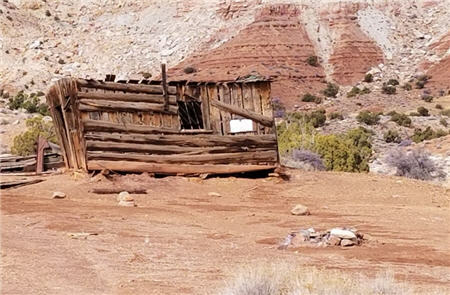 The historic, small-scale mining operations that occurred at Temple Mountain on and off for decades were a reflection of how much less technologically sophisticated mining operations were in previous generations. With modern mining exploration techniques (plus decades of data), American Battery Metals is well-positioned to establish the Temple Mountain Project as a site for potential commercial-scale vanadium (and uranium) mining. While the story at Temple Mountain itself is high-grade vanadium & uranium mineralization, when investors look at American Battery Metals (trading on the CSE under symbol “ABC”), the word that likely comes to mind is “value”. For investors looking to ride the next wave higher in the vanadium market, ABC’s market cap is an extremely compact $8.5 million (as of this writing). And this isn’t early-stage exploration, where the existence of significant vanadium mineralization has yet to be confirmed. The mineralization here is known, high grade, and near surface. Investors also need to be cognizant of the uranium mineralization at Temple Mountain. 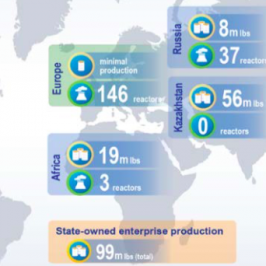 After many years of a uranium bear market, a rising chorus of mining analysts are predicting a strong rebound in uranium – sooner rather than later. In addition to the $1.5 million that the Company raised with its IPO, American Battery Metals could see more than $1 million flow into its treasury via the exercising of warrants – with those warrants currently clearly “in the money”. Temple Mountain is a flagship vanadium Project that provides investors with a strong foundation. American Battery Metals boasts a management team with their fingers on the pulse of the vanadium market. Offering additional upside is the Company’s Fish Lake Valley lithium property. Located proximate to the Rhyolite Ridge lithium deposit in Nevada (currently a 4.1 million tonne lithium carbonate resource), Nevada is renowned as one of the world’s hot-spots for lithium exploration. With the price of lithium trending lower in recent months, management is squarely focused on Temple Mountain at present. Meanwhile, with the price of vanadium also temporarily lower, this provides investors with an attractive entry window to gain exposure to this rising sector. For investors looking for a strong vanadium asset with an astute management team – at a great value – it’s as easy as “ABC”. Disclosures: The content of this article is for information only. Readers fully understand and agree that nothing contained herein, written by Jeff Nielson of StockHouse.com as a Guest Post about American Battery Metals, including but not limited to, commentary, opinions, views, assumptions, reported facts, calculations, etc. is not to be considered implicit or explicit investment advice. Nothing contained herein is a recommendation or solicitation to buy or sell any security. [ER] is not responsible under any circumstances for investment actions taken by the reader. [ER] has never been, and is not currently, a registered or licensed financial advisor or broker/dealer, investment advisor, stockbroker, trader, money manager, compliance or legal officer, and does not perform market making activities. [ER] is not directly employed by any company, group, organization, party or person. The shares of American Battery Metals are highly speculative, not suitable for all investors. Readers understand and agree that investments in small cap stocks can result in a 100% loss of invested funds. It is assumed and agreed upon by readers that they will consult with their own licensed or registered financial advisors before making any investment decisions. At the time this article by Jeff Nielson of StockHouse.com was posted, Peter Epstein owned shares in American Battery Metals and it was an advertiser on [ER]. Readers understand and agree that they must conduct their own due diligence above and beyond reading this article. While the author believes he’s diligent in screening out companies that, for any reasons whatsoever, are unattractive investment opportunities, he cannot guarantee that his efforts will (or have been) successful. [ER] is not responsible for any perceived, or actual, errors including, but not limited to, commentary, opinions, views, assumptions, reported facts & financial calculations, or for the completeness of this article or future content. [ER] is not expected or required to subsequently follow or cover events & news, or write about any particular company or topic. [ER] is not an expert in any company, industry sector or investment topic. First Cobalt Corp., Oversold, Poised to Move Higher? California Gold Mining Inc. 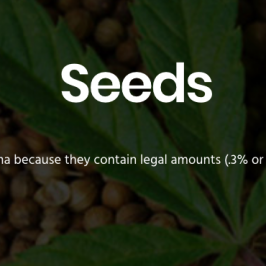 Entering High-CBD Content Hemp Seed Market in the U.S.